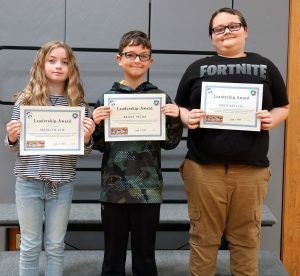 SANDY CREEK – Sandy Creek Elementary School held their third quarter Character Awards ceremony where students were honored for exhibiting the character traits promoted by the Leader in Me. The students were recognized in two ceremonies: those in Kindergarten to grade two and grades three through five, by Principal Tim Filiatrault. Fifth grade leadership awards were presented to Madelyn Coe, Brody Pecha and Owen Battles for the third quarter of the year. Parents and family members were invited to witness the students’ recognition. The following students were honored for habit #1: Be proactive – David Decker, Kendra Friot, Jaykob Guile, Dylan Tennant, Leland Robinson, Lila Delisle, Catherine Crawford, Hunter Dingman, Jake Berrios, Fiona Prairie-Rocca, Duth Van Valkenburgh, Mark Becker, Lynn Dumas, Gerald Costello, Lyla Thomas, David Dillabough, Gavin Gilbert, and Emily Mintonye. Habit #2: Begin with the end in mind – Callen Montieth, Hunter Soluri, Noah Gioia, Treylen Hunt, Omae Khan, Ian Eveleigh, and Ian Ward. Habit #3: Put first things first – Quinn Pratt, Abbygail Peter, Lexxi Willson, Charles Matter, Jacob Chen, Tucker Marshall, Alyshia Dugin, Averie Thomas, Madison Snow, Isabella Taplin, Lawrence Herse, Tucker Nevills, Jace Dann, Eli Ryerson, Jacob Keesey, Logan Allen and William Garvin. Habit #4: Think win-win – Maddie McGrath, Layla Bristol, Savannah Snyder, Cole Zehr, Julia Cooper, Megan Burton, Hector Salgado, Jaxson Wheeler, Owen Ward, Jacob Brown, Chase Brown, and Logan Bort. Habit #5: Seek first to be understand, then to be understood – Seth Yerdon, Bella Hoffman, Lilly Trumble, Cole Wilson, Gabriella Peter, Leia Wall, Erick Garno, Blake Stock and Tyler Mascellino. Habit #6: Synergize – Maiah Owen, Brennen Sherman, Kaylie Parker, Kendall Jones, Loki Trumble, Jonathan Poyneer, Burke Harvey, Abigail Jones, Elise Cranker, Alina Khan, Samuel Tessier, Lacey Thran-Reed, Russell Thomas, Natalie Howard and Parker Rathbun. Habit #7: Sharpen the saw – Layton Gibbons, Brayden Miick, Baylee Williams, Hunter Green, Brixton Bell, Kameron Basler, Abbigail Snyder, Olivia LaCelle and Brayden Ashby. In addition, a special “find your voice” award was presented to students who went above and beyond in the reading challenge and read beyond their goal for the month of March. Grades K-2 awards were presented to Jase Soluri, Emerson Jones, Allison Jones, and Maxon Soluri and the grades 3-5 award was presented to Natalie Nemier. A special leadership award was presented to three fifth graders who were nominated by their peers for showing leadership skills and the seven habits. Nominations were read by students as the names were announced. Leadership awards were given to Madelyn Coe, Brody Pecha and Owen Battles. In addition to the first quarter awards, a special attendance award was presented to the grade level who had the highest percentage for the month of March. For grades K-2, the first grade students earned the highest attendance with 93.31% and for grades 3-5, the fifth grade did the same, earning highest attendance for March with a 94.43% during that month. The fifth graders have earned the attendance award for each quarter so far this year. The grades will display outside of their rooms a special certificate that advertises the outstanding attendance percentage.